At www.robe-shop.com, we make judicial robes of the highest quality for our customers in a unique combination of elegance and comfort. The superb craftsmanship of our custom tailoring ensures an optimum fit, and the selection of exquisite outer and lining fabrics creates a classic, high-quality appearance of the highest level, and lends ladies and gentlemen from the judicial profession a fine bearing. Judicial robes are a special acquisition. They are a part of the wearer's professional life for years, and must distinguish themselves by their high durability and good quality so that they do not use their elegant appearance after frequent use, especially as robe wearers hold an extremely representative office in addition to their professional responsibilities. 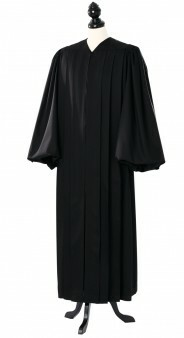 At www.robe-shop.com we offers a selection of judge robes in particularly classic cuts. For judges, the robe is part of the normal working day, so it needs to meet particularly high demands in regard to comfort and fit, and must not lose its elegance after frequent use. At www.robe-shop.com we have recognized these requirements, and meet the demands of our customers thanks to our high-quality fabrics with uniquely climatizing features for extremely good breathability. We only use premium Merino wool for the outer fabric of our judicial robes because it has particularly good thermoregulation characteristics, and can be woven to create a cloth which is soft to the touch and falls lightly. To refine our robe fabrics further, we work silk and cashmere into the weave to support the fine, subtle shimmer of judge robes. Because we use the finest yarns to weave our cloths, our robes are light, and are so superbly comfortable that our customers like to wear them every day. 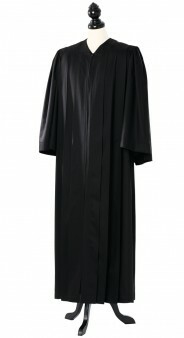 Thanks to the outstanding stability of the materials, judicial robes from www.robe-shop.com are also impressively easy to clean, and extremely crease-resistant.